National Steel Building Construction (NSBC) has delivered hundreds of Steel Building Kits designed specifically for virtually every use imaginable. While many of our customers continue to use their buildings for more traditional applications such as warehouses, industrial spaces, workshops, garages and barns, others come to us daily wanting all of the benefits of a prefab metal building but with a more specific use in mind. These “outside the box” thinkers are some of our most valuable customers because they have proven that our pre-engineered buildings can be the best choice for many different projects such as schools, museums and fire stations. The building systems offered by National Steel Building Construction (NSBC) are different than any other type of steel buildings. Our metal building kits are unique because the building system bolts together, and all of the welding is done at the factory prior to delivery. In fact, all of your framed openings for functional necessities such as windows, doors and even skylights are pre-punched before arriving at your job site. These details may seem minor, but these differentiators from other building systems significantly reduce construction costs and make many of our steel building kits do-it-yourself friendly, no matter the type of project. Our metal building kits come as basic building packages that can be customized in both look and functionality. You do so by selecting various interior and exterior accessories to add to your base building package. This customization process is what takes an ordinary metal building shell and transforms it into a garage, shop or professional office space as seen in the example below. Choosing the color combination you will use on your walls, roof and deluxe trim package is a great way to personalize your building. Browse through photos of some of our most popular metal building color schemes. Other than the anchor bolts and the concrete foundation you plan to build it on, each kit will arrive with everything you need to assemble your new building quickly. Rest assured, a steel building kit is not a square 20×20 cookie cutter box with limited options; it’s actually quite the opposite. While a basic building is sufficient for many projects, there are a multitude of accessories designed specifically for metal buildings to customize the look and functionality of your kit. How We Help You: The project experts at National Steel Building Construction (NSBC) will help you determine exactly what building you need for your location and application. We take ample time to evaluate the local requirements, including snow loads, wind speeds, and seismic conditions for your unique geographical location. We also take into consideration the intended application for your new building, because secondary loads – such as cranes and lifts – can change how the building is engineered. We Are Your Design and Construction Resource: Over the past decades, we have assembled the most experienced team in the industry. Whether you decide to purchase a steel building, our team will do its best to guide you and help you understand why the majority of consumers end up choosing a prefab metal building over the alternatives. Your steel building kit will include everything you need, along with detailed erection instructions to put together the exact building you ordered. How our steel building kits are delivered. Steel building kits are a cost-effective and efficient way to get the extra space you need for your home or business in the form of a durable, easy to assemble building. A steel building kit is engineered for your local area, arrives conveniently at your job site on a truck and includes a bundle of I-beams, wall sheeting, secondary framing, roofing panels and instructions providing a step-by-step guide to erect your steel building. In fact, as long as you contact us to make sure the codes and loads will be correct for another locale, these kits can be just as easily disassembled and transported to another location to be assembled again. This is a distinct feature of our building kits – they are both flexible and personalized, and can travel with you should you need to change locations. Making the best choice for your project. If you need space and have been searching for a solution, you have many different construction methods to choose from. In addition to the kits National Steel Building Construction (NSBC) provides you have probably run across other options such as: arch style, light gauge, open-web, tube steel, weld-up and even pole barns which are actually made of wood. While each type of construction seemingly has its pros, most agree that you get what you pay for. Cheaper buildings may come across as a viable option but the reality is, economy buildings can actually be less safe than steel buildings. Get an idea how easily our kits are constructed. The instructions provided here are by no means comprehensive, but our kits are extremely easy to install. Many of our popular types such as garages and workshops can be assembled over a weekend with a small crew and a forklift or cherry picker. Unload, Open, Organize: Most steel building kits can be unloaded from the flatbed truck using a standard forklift. Once unloaded, open all boxes and organize the parts in a logical manner. Review Instructions: Carefully review the erection instructions and establish safety protocols. Both should be followed for the duration of the project. Attach Columns: Using a forklift or crane, bring the columns into place and attach each column to the anchor bolts. Attach Rafters to Columns: Assemble the two part rafters and using a sling lift the rafter into place with a tagline for control and a crew member on each column to guide the rafters into place. Repeat: Repeat steps until all columns and rafters are installed and attached to one another. Attach Wall and Roof Panels: Once the primary framing is complete, you can install the framed openings and attache the wall and roof panels to complete the kit. Our team is standing by and ready to help you select a steel building kit. Why National Steel Building Construction (NSBC) ? We would like to take this opportunity to thank you for your interest in the pre-engineered steel building industry, and particularly for your interest in our company. – Strength: Engineered to exceed your local design requirements for snow, wind and seismic loads. Stamped engineered drawings available for all states. – Shipping: Materials nest together for economical shipping making freight cost lower and we typically include the freight. – Accessories: Complete line of accessories and options. Doors – Windows – Insulation – Overhang – Wainscot – Etc. – Included in pricing are 1 walk door opening, and all overhead door openings, these include all framing and trim (doors not included). Accessories (Walk doors – Windows – Insulation, etc.) are available. – All structural members are high strength 57,000 psi steel, cut to length, and pre-punched for easy assembly with either 1/2” bolts or self-drilling screws. Bolts and screws for the framework are supplied by us. – Wall panels are 26ga. 80,000 psi galvalume steel. They are comprised of a modified silicone polyester paint applied over the top of already galvalume steel panels. There are 13 standard colors. – All roof and wall panels are attached with self-drilling fasteners. Wall panel fasteners are color matched. All panel laps are fastened with self-drilling fasteners. Roofing side laps receive roll mastic sealant. Gable ends and eave of roof receive a die formed foam closure to “bird-proof” the building, sealing off all openings. – All buildings come completely trimmed out in color. Sculptured gable, eave, corner and base trim, as well as jamb and head trim are included. Gutter and downspouts are an option. Trim material is the same as wall panels. Prefabricated and Pre Engineered steel building kits have advantages over building a structure traditionally from the ground up for many reasons. If you have little or no experience in designing a steel structure these kits are the way to go. They come in a variety of sizes and dimensions that are tailored to fit any purpose you have in mind. Whether you are looking to add to an existing structure, build a garage to keep your vehicles safe, or wanting to add a building to be used as shed or shop on your property, you will be able to find a steel kit that fits your needs. If you have priced the cost of building a structure using normal construction methods you know how expensive they can be. The design, the materials, the labor, the additional costs can weigh your dream down and make it unreachable. But, Prefabricated building kits costs far less than having a construction crew build it from the ground up. All of the pieces are manufactured to fit together easily and perfectly and are all pre cut to the exact design specs required for the structure. You will still have to pay for the construction of the building when you purchase a building kit, but the construction time is reduced significantly and this results in savings of over 50% when compared with the construction cost of stud frame or post frame buildings. 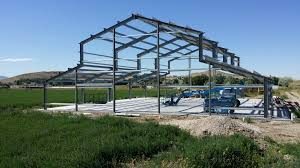 National Steel Building Construction (NSBC) metal building kits are a fantastic choice for the do it yourself kind of person who needs some type of metal structure or various types of carports to store their vehicles or other forms of equipment that they may need for their personal or business use. The kinds of buildings that could be made from these kits can be found in all sorts of different settings and locations, some of the most common of which are commercial settings like an industrial park or a medical facility. Some of the other functions are they serve our storage and meeting place locations for various places such as airports and shopping malls as well as motels and schools, and even churches have been known to use these types of structures on occasion for various causes and events. The manufacturers such as National Steel Building Construction (NSBC) for example, don’t just make your average metal structure or carport but they can also make any type of building or structure to your custom needs were specific design issues. These guys have been around for many years serving all of their customers through high quality customer service and a fantastic product. There some other advantages to going with National Steel Building Construction (NSBC) metal building kits, these fantastic structures come in a packaged and unassembled shipment, this is particularly economical for those who wish to save a little bit of money but still want to get a high quality metal structure as well. This is because for those who know how to set up these types of buildings and structures, going with a unassembled and thus cheaper metal building, they end up not only save money but also giving valuable experience as well. Not to mention the fact that they don’t end up having to deal with the complications that can come from using hired help. National Steel Building Construction (NSBC) Steel Buildings metal garages are the ideal economical solution to shelter vehicles, boats, RV’s or ATV’s. They offer a durable low cost do-it-yourself alternative and are available in many sizes for residential Steel Garages or RV Storage Buildings. Our metal garage kits are prefabricated for a fast simple bolt together construction yet engineered to withstand heavy snow and severe hurricane force wind conditions. Want to match the other buildings on your property or add an architectural accent to your building? 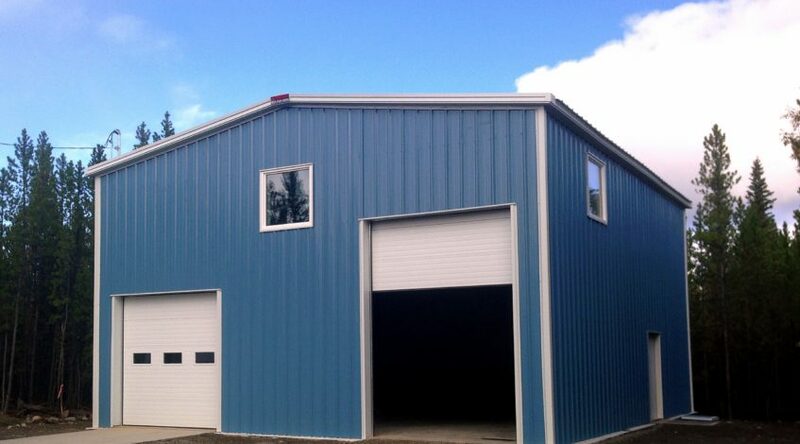 National Steel Building Construction’s prefab garages are available in beautiful colors. The color paint is extremely durable, comes with a 40 year warranty and is Energy Star approved. If you are under any type of time constraint the fabricated building kit will save you significant amounts of time. Anyone who has undergone a construction project knows how stressful it can be. Problems always arise due to weather, materials, or mistakes. You do not want your new garage to take months to build when you need it to be done yesterday. The steel building kits save time because they are ready to be fit together when they leave the manufacturer. This process makes it easy for the homeowner to plan out the timeline and have a much better idea of when the building will be done. National Steel Building Construction (NSBC) Prefabricated Steel Buildings are also good when it comes to durability, maintenance, and energy cost. Steel is an extremely durable and weather resistant material to build with. Your building will be able to withstand high winds, hurricanes, earthquakes, and torrential rains or snows. You will not have to worry about termite infestations or paying exterminators to come out and remove them. Insurance companies love steel buildings because they can withstand harsh weather conditions and fire. You will see insurance savings when you erect this kind of structure. The maintenance required for steel buildings is no more than using soap and water to clean. The steel building will not rot, crack or split like other building materials. You can have your Pre Fabricated parts coated and painted by the manufacturer and these coatings usually carry a long warranty with them. If you prefer, the steel buildings can even have masonry or glass finishes. The low maintenance required also makes the buildings energy friendly. Steel buildings last lifetimes longer than other materials, they do not release toxic chemicals like some treated wood, and they are 100% recyclable. A fabricated steel structure is also highly energy efficient. The insulation that is applied to the steel building results in a high ability to retain the heat and cold. One of the other factors to consider is that most of these structures are extremely fire resistant and that most of the metal that is used to produce not only the metal building kits but the preassembled buildings as well come from recycled materials, and are of us effectively “green”.one of the other benefits to going with the metal base structures the fact that the ruse actuated much less than conventional roofing shingles, this is particularly helpful in the durability of the structure as there is much less stress on the building overall, so be sure to consider National Steel Building Construction (NSBC) metal buildings as part of your selection. Most property owners at one time or another will take on a remodeling project of some kind. Purchasing a PreFabricated steel kit allows you to make these future modifications easier and less costly. When you want to expand the steel building, take out the sidewalls, put up the new framework you want, add finish with the panels for the roof and new walls. The manufacturer that was used the first time you built can easily be used again to accommodate your growing needs. The manufacturers will be able to assist you with design, erection, and materials needed for any expansion. Investing in buildings made of steel will leave you and your bank account protected. They are as versatile as your needs. If you are building a barn or garage for your home or looking to expand your business, the kits are the most economical way to go. Steel partitions or inner walls can be added to your building design to create stalls for livestock, separate office spaces, or specific shop areas for your hobbies and projects. The buildings cost around 50% of a normal wood frame or brick building. There will be little construction to be done, no wasted materials to dispose of and no welding will have to be completed for these Prefabricated steel buildings. The steel building kits are by far the best choice for any remodeling or expansion needs. They are used as barns, schools, churches, garages, airplane hangars, boat and RV storage areas, office buildings and some people even use them when building their own home. Every National Steel Building Construction (NSBC) steel prefab garage is manufactured using only USA made hot dip mill coated Galvalume steel specially formulated to repel rust corrosion giving you a virtually maintenance free steel garage building. Since these all steel structures have no wood there is no wood rot, warping, sagging, or knot defects which means no time consuming or expensive repair bills. There are NO roof trusses or beams so there is no place for rodents and birds to nest above your vehicles and soil them or the working area below. National Steel Building Construction (NSBC) steel garages not only have an assembly process that is easily done with general labor, but they have superior strength as well. This feature is derived from both the unique building design, which has an engineered redundant overlapping of the panels, and the extremely heavy gauge of steel used. You can feel confident that your tools, cars and toys are protected and secure which is why a National Steel Building Construction (NSBC) steel garage building is the first choice for RV Storage Buildings and prefab garages.